"The easiest way to do something, is the wrong way, but the bitterness of poor quality lingers long after the sweetness of low price is forgotten". 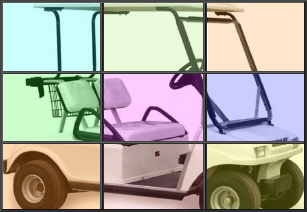 Have questions about your golf cart? You might just find the answer on the forum that I moderate at Buggies Unlimited called Ask The Cartfixer. You can view the answers to previous posts or start a new thread. Ability to perform Factory Warrantee on Club Car, EZGO and Yamaha. Dedicated Truck to Fleet operations. Proven life extension of major operating components. Largest on truck parts inventories, reducing your down time. No part or tool inventories. Highest trained technicians in the county. Factory Certified on Club car, Ezgo, Yamaha, Taylor Dunn, PLUS Tomberlins, Ford Thinks and Chrysler GEMS, as well as many other makes. 99% of all repairs are done onsite. The best equiped, best trained golf cart repair shop in Central Florida. Experience a trained golf car repair specialist. While playing golf my Yamaha cart made a loud popping noise and stopped moving. I was towed home from the course and called a local repair person. They picked up my cart and called the next day to tell me my engine had severe internal problems, according to their machine diagnostics, and would need rebuilding or a new engine. A rebuild would cost $2,000.00 or a new engine to replace mine would be $3,000.00. I had them bring my cart back. I called Michael Thomas at Cartfixer and asked him about these prices. He felt like the prices were outrageous and that the guy was trying to rip me off. Michael said he would look at my cart at no charge just to help out. Within 10 seconds he had my cart running and for about $100.00 replaced a broken accelerator cable. I found out he has worked on carts of other neighbors of mine and all highly recommended him because of his honesty and quality of work. He is a real professional with 28 years in the repair business. I highly recommend Michael Thomas and Cartfixer.